Last Sunday morning we celebrated surviving the blizzard by enjoying gluten-free Overnight French Toast Casserole. It seemed like we should mark the occasion by doing something special, and shoveling snow was not it. Shoveling snow is a requirement after a blizzard, but most definitely not a way to celebrate. So enjoying French Toast Casserole certainly seemed like the right way to go. I am happy to say that “the right way to go” and “delicious” often go together in my house! According to several “official” reports, we got somewhere between 15 and 17 inches of snow. At either measurement, we definitely got far less than the predicted “worst case scenario” for our area. And for that we were grateful, as the amount of snow we did get was plenty. 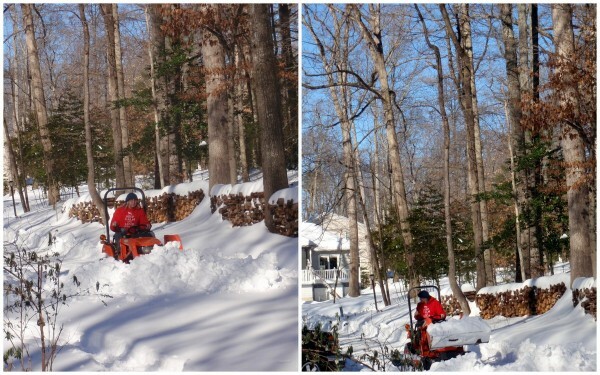 Thankfully, our neighbor has a Kubota tractor that can be outfitted with a blade for snow removal. Mr. GFE helped her get it mounted properly so after she cleared her driveway, she let him use it to clear ours. It was a tremendous help! We were also thankful that we didn’t lose power during the blizzard. We heat our house with wood. I’m the “keeper of the flame” and Mr. GFE is the wood provider. If you’re familiar with the ant and the grasshopper fable, Mr. GFE would most definitely be the ant as far as being prepared with firewood for the winter. 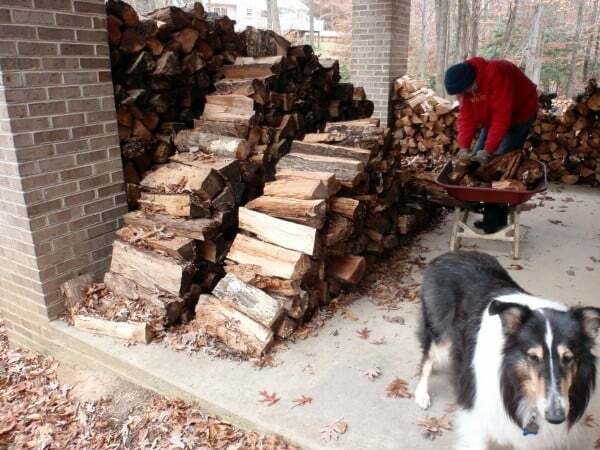 When the blizzard arrived, we had about a cord of firewood on our patio ready to be used. That was down from two cords a few months back. Needless to say we weren’t worried about being cold if the power went out, but we were still very happy that we did not lose power. 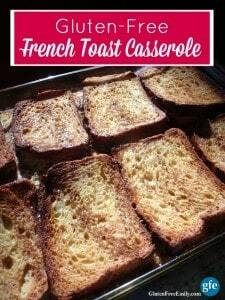 I “need” my lights during the winter and it would have been impossible to make this gluten-free Overnight French Toast Casserole in my wood stove. This Overnight French Toast Casserole is a gluten-free version of the same recipe I have used to delight overnight guests for years—now simply made gluten free by using gluten-free bread. That’s it. That’s the only change I made to the original recipe. I love it when gluten-free “conversions” are super easy! But here’s a confession … before I located my old recipe (which was “hiding” in plain sight in my recipe box), I actually played around with some other ideas trying to recreate it from memory and tasting along the way. I got close to the original recipe, but never got it just right, so it was a relief to find my tried and true recipe a few weeks ago. By the way, before the blizzard, some gluten-free friends and I were chatting about what people always buy before snowstorms. Toilet paper. Eggs. Bread. Milk. In the final hours before the blizzard started, more than one gluten-free friend reported that the gluten-full bread and milk were all gone, but plenty of gluten-free bread and almond milk remained. For once, being gluten free and even dairy free was an advantage! How cool is that? One of my friends, Debi of Hunter’s Lyonesse noted the eggs, bread, and milk and said, “Hey, they must all be making French Toast!” Sounds so good, right? Snow or no snow. Make this gluten-free Overnight French Toast Casserole for breakfast, make it for lunch, make it for dinner, make it for family, make it for guests. Make it for the next snowstorm. Did you survive the blizzard? Did you make something special after (or during) the storm? Suitable for your overnight guests, but will be loved by your family any time! Add brown sugar to baking dish. Stir into butter until mixed. Place 8 slices of bread in the bottom of the baking dish. In large bowl, mix eggs, milk, and vanilla extract, beating well. Pour half of the mixture over the bread in the baking dish. Sprinkle with cinnamon. Add another layer of 8 slices of bread. Pour remaining egg mixture over the bread in the baking dish. Sprinkle with cinnamon. Serve with maple syrup or honey. We like a mixture of honey and melted butter as our “syrup.” You can also sprinkle your finished casserole with powdered sugar before serving with maple syrup or honey, if you wish. If you wish to use gluten-free French bread and don't have a ready-made option, you'll find some terrific French bread recipes here and here.If using French bread, you'll place the 8 slices in the bottom of the baking dish and pour all of the egg, milk, and vanilla extract mixture over the slices.For an “eggier” result, you might want to add another egg to your egg, milk, and vanilla mixture.For prettier results, use your bread "heels" (ends of the loaf) on the bottom layer.Because there are only two of us, we could not eat all of this casserole immediately, so we ate it over several days. It did dry out a little, but it was nothing that a tad more maple syrup or buttery honey topping couldn’t fix! Originally published January 30, 2016; updated April 14, 2018. Another year that the East Coast seems to have gotten our snow! It’s been cold here, but the snow has been few and far between. Glad you didn’t lose power and that you stayed warm! Hey Megan–I’m so sorry you haven’t gotten much snow this year. I do love snow. That’s partly because I’m in an area where it doesn’t take much snow to shut things down, so life doesn’t just go on as normal. That would be no fun in my book! Thanks so much for the feedback on my recipe and for sharing it with your readers! It looks like Mr. GFE may be having some fun with that piece of machinery! Glad all is well. We’re get those piles of snow, now, too! I’m guessing your snow is gone now and life is back to normal although I’m not sure if life just goes on when it snows where you live. Snow hasn’t melted here yet; it has been a little too cold for it all to melt away in the city. It’s good though because the mountains are holding onto all of that snow to end that drought we’ve had! I’ve always been a huge fan of French Toast, but have never made it this way! I’m going to try your method, Shirley. Also, it was so reassuring to see that you sometimes lose track of your recipes! Drives me crazy when I do that! I love seeing all the snow. We need a good dumping like that here! 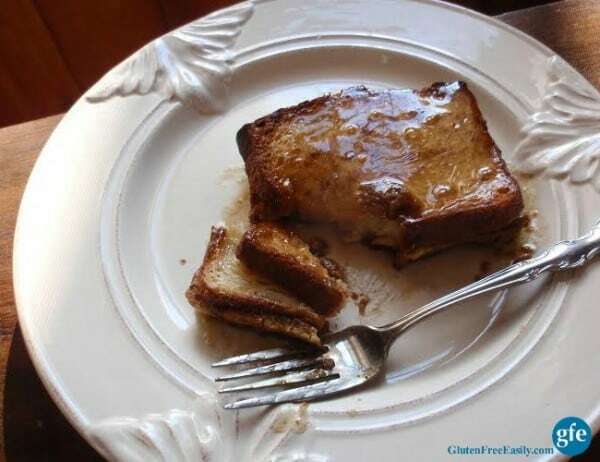 Hi Michelle–This is the only way I’ve made French Toast for many years (although there was a big time gap since going gluten free), and I typically only make it when we have overnight guests. I’m sure this casserole would go quickly with your family of four though so you wouldn’t need to wait for a “crowd” to make it. Especially with three “boys” in your house! Use your favorite gluten-free bread and I don’t think you’ll be disappointed. One blogger friend recommended Whole Foods gluten-free bread for the best French toast. I don’t have a Whole Foods near me, so I’ve never had their bread. I hope you got some snow since you left this comment or will get some soon. February can be a good month for snow! Thanks for commenting and thanks for sharing this recipe with others! That is delicious french toast casserole. That is lot of snow Shriely, Hope it is fine now. 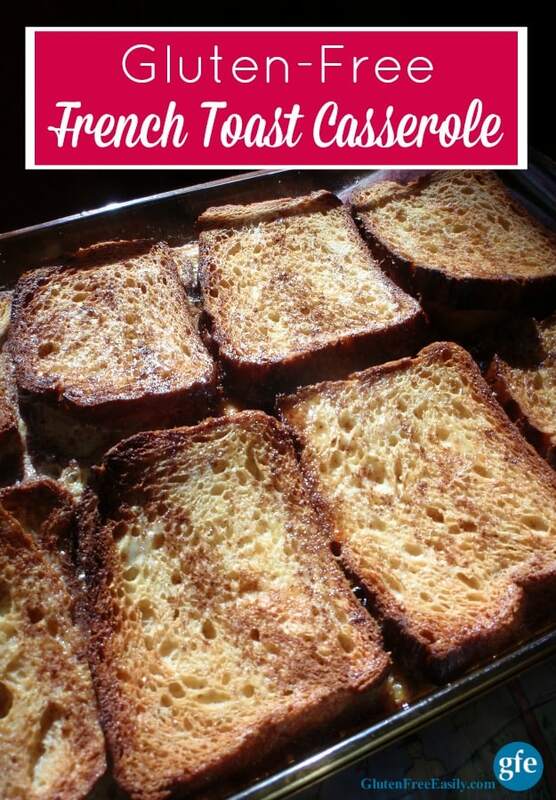 Thanks for sharing this delicious French toast casserole to Hearth and soul blog hop, pinning and tweeting. Thanks, Swathi! All except a few piles of snow here and there have disappeared, but we’re expecting a little more snow tonight/tomorrow. Nothing like the last snow though! We are not facing a blizzard but it is 23 degrees today and it is a shock after all the warm weather we have been having all November. Putting on the oven and making this French Toast Casserole would warm up our bodies and spirits. Looks delicious! Hi Barb–Welcome to gfe! 🙂 Canyon Bakehouse bread should work fine. Any good quality gf bread should work, and by good quality, I mean a bread that tastes like gluten-full bread and has a doughiness to it. With successful French toast, the key is for the bread to absorb the egg mixture well. I agree that the Hawaiian bread would be wonderful to try in this recipe. I have not seen it yet either. Fingers crossed that you have great results when you give this recipe a try!